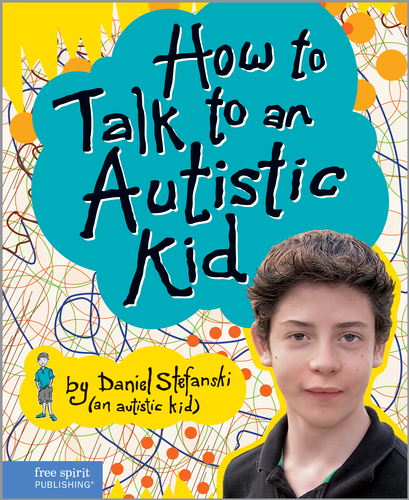 Daniel Stefanski, a 14 year old middle school student on the autism spectrum wrote this book to help readers (young and old!) better understand autism and the people who fall somewhere on the spectrum. Daniel's book goes beyond simply how to talk to a kid with autism and helps readers understand how they can break through the stereotypes of autism to understand that people with autism just understand things different. Daniel offers many suggestions from how to be a good friend to how to get along better with kids with autism. His hopes are that kids without autism will feel more comfortable around kids with autism and hopes fewer autistic kids will feel lonely. Through a series of situations that he and his friends go through almost on a daily basis, David helps readers understand how to navigate situations without hurting anyones feelings. I believe that this book is a great example of Element Six because the book really takes an issue that affects so many communities and gives readers an easy to understand 'How To' lesson. Autism Spectrum Disorder (ASD) affects 1 in about 68 children, so its prevalence is widespread, especially in schools, and the chances that it exists in most schools is very likely. By addressing what kids with autism do and don't understand, and what they have trouble feeling, it can help other kids who are not on the spectrum to have acceptance and begin to understand at an early age that although kids with autism are different, they are still kids. The book does a great job at taking various situations and helping kids take social action into their own hands by giving them the tools to navigate these situations, when they otherwise may not know what to do. Daniel even helps readers by offering suggested language that is sensitive enough for kids with autism to understand. First, it is important to gauge your classroom, depending on if it is inclusive or not, to see how comfortable students on the spectrum in your own inclusive class would be discussing their own autism to the class. If there is interest, have students on the spectrum get into groups with general education students have have students with autism discuss their own autism and perhaps come up with a few 'How To' guidelines. Students in groups will put together a mini-book with illustrations to present to the rest of the class. In a general education classroom, have students choose a social action that they feel strongly about (unisex/transgender friendly bathrooms, recycling, tackling racism at school, bullying) and have them either in partners or individually put together mini 'How To' booklets on how to embrace the social justice issue and publish the books around the classroom for others to read. In a special education classroom, have students each create a dedicated page that will make a class book. Each student will work with his or her parents on a special day in school to describe something that they wish to tell others about their disability or certain characteristics about the student that they would be grateful if others knew about them. Each student will present these characteristics to the class and help others learn what they could do to make the situation better. In early childhood classrooms, provide scaffolding like "What I don't see…" for students who do not understand body language or sarcasm, or "I do not like it when…" for students who are sensitive to loud noises or yelling.